Image caption Mr Blanchard said that the global economy is "not out of the woods yet"
The IMF chief economist has told the BBC that Chancellor George Osborne should consider slowing down austerity measures in his March budget. 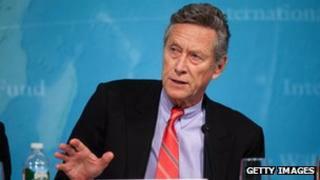 "We think this would be a good time to take stock," said Olivier Blanchard, speaking to Radio 4's Today programme. He also said the global economy was "not out of the woods yet". In October, Mr Blanchard claimed in an IMF report that austerity had hurt wealthy countries such as the UK far more than most analysts had expected. His comments come the day after the IMF cut its 2013 forecast for UK economic growth to 1% from the 1.1% predicted in October, and will put pressure on the chancellor as he prepares to deliver a speech at the World Economic Forum in Davos later on Thursday. Mr Osborne is likely to come under further pressure to change economic policy on Friday, when official figures are expected to show that the UK economy contracted again at the end of 2012, after only three months of expansion. And Monday's figures showing a slight year-on-year increase in public sector net borrowing have fuelled fears that the UK could lose its coveted AAA credit rating, thereby potentially increasing the government's cost of borrowing. But Prime Minister David Cameron defended his government's economic record in his Davos speech on Thursday morning. "How do we succeed when other nations are growing, changing, innovating so fast? A lot of the answers are clear. Deal with your debts. Cut business taxes. Tackle the bloat in welfare. And crucially: make sure your schools and universities are truly world class. "In the UK we've been doing all these things. Less than three years in and we've cut the deficit by a quarter. Our corporation tax rate is the lowest in the G7." Talking to London's LBC Radio, Deputy Prime Minister Nick Clegg said: "I agree with Blanchard when he says we need to be steady and sensible and pragmatic, not dogmatic, not ideological, in trying to balance the books. "If tax receipts go down and welfare payments go up, we are not going to just keep chasing our tail. We are going to allow borrowing to go up to cover those costs in a sensible and pragmatic way." But Ed Balls, Labour's shadow chancellor, told the BBC: "David Cameron and George Osborne must finally heed the IMF's advice. "They have repeatedly warned that a change of course would be needed in Britain if the economy turns out worse than expected. After two-and-a-half years of flatlining and a double-dip recession the IMF is now clearly losing patience. "The longer the government clings on to its failing plan, the more long-term damage they will do to our economy." Mr Blanchard's analysis showed that the impact of spending cuts and tax rises on economic growth had been 2-3 times greater in the lacklustre economic conditions since 2008, than had been the case in the previous three decades. However, Mr Blanchard told the BBC that the Fund had recommended from the beginning that spending cuts should not be too drastic. "We've never been passionate about austerity. From the beginning we have always emphasised that fiscal consolidation should be slow and steady," he said. Although he admitted that some countries, such as Spain, had little choice about pushing ahead more quickly because of the pressure they had come under from financial markets. He also said that the Fund's advice to the UK had not fundamentally changed. "We said that if things look bad at the beginning of 2013 - which they do - then there should be a reassessment of fiscal policy," he said of George Osborne's budget plans. On the question of David Cameron's promise to offer a referendum on whether to stay in the EU after the next general election, he said "there are clearly enormous advantages" to being in the EU. But he added: "There are some costs, and [the British public] have to assess".